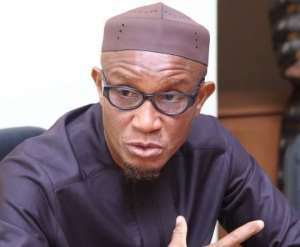 Mr Mustapha Abdul-Hamid, the Minister of Information, has urged Ghanaians to aid the fight against corruption by ending the persistent requests for unrealistic financial assistance from public officials. The Minister also encouraged his colleagues to firmly but politely turn down such requests, which could drive them into corruption by explaining to askers that it was impossible to find adequate money from their salaries to honour every request. Mr Hamid gave the advice, in Accra, as part of his submission at the maiden edition of the Public Accountability Lecture Series (PAL Series) at the University of Professional Studies, Accra (UPSA). The lecture was under the theme: "Is Ghana Losing the War Against Corruption?" Explaining his position, Mr Hamid said one Wednesday, he decided to take account of the requests brought by those who visited him at his office. To his surprise, he said, out of the 60 visitors, 59 asked for some form of financial assistance, with the remaining person, seeking a job. "So really and truly, I keep asking myself whether it is true that we are unanimous in our abhorrence for corruption or not?' he questioned. 'I don't believe that is the case; it means that some people expect us to be corrupt, so we can feed their insatiable desires for monies for whatever purposes they have." Mr Hamid stated that, in Ghana, ministers of state did not sign cheques for any procurement or whatever. The chief directors, however, signed those cheques based on the directives from their sector ministers, but the Ministers, he said, were ultimately answerable to Parliament about how their sectors' finances were disbursed. Mr Hamid noted that successive governments had been genuine in their desires to fight corruption, citing legislations such as the Whistle Blowers and the Public Procurement laws as some of those efforts. However, he said, with concerted efforts and determination, the corruption canker could be brought to the barest minimum. The PAL Series is the effort of the UPSA's Centre for Public Accountability to contribute to finding a permanent solution to the ill-phenomena of corruption. The annual event would subject the nation's anti-corruption efforts to close scrutiny, while proffering workable solutions to the problem. For his part, Prof Abednego Okoe Feehi Amartey, the Vice Chancellor, UPSA, said the cost of corruption was calamitous for a highly-endowed country such as Ghana. 'A cedi stolen from the state means denial of the right to education or good roads,' he stated. Mr Justice Emile Short, a former Commissioner of the Commission on Human Rights and Administrative Justice (CHRAJ), who was supposed to deliver the keynote address, could not make it to the function, due to circumstances beyond his control. However, the host of the programme, Mr Samson Lardy Anyenini, a Private Legal Practitioner and also of Joy FM News file, was able to bring out certain key statements from Mr Short's speech to put questions to the discussants. The panelists included Mr Franklin Cudjoe of Imani Africa and Mr Michael Boadi, Corporate Affairs Manager of Ghana Integrity Initiative. Both men in their submissions agreed that Ghana had done well in the fight against corruption; however, more efforts needed to be made to achieve the desired results.